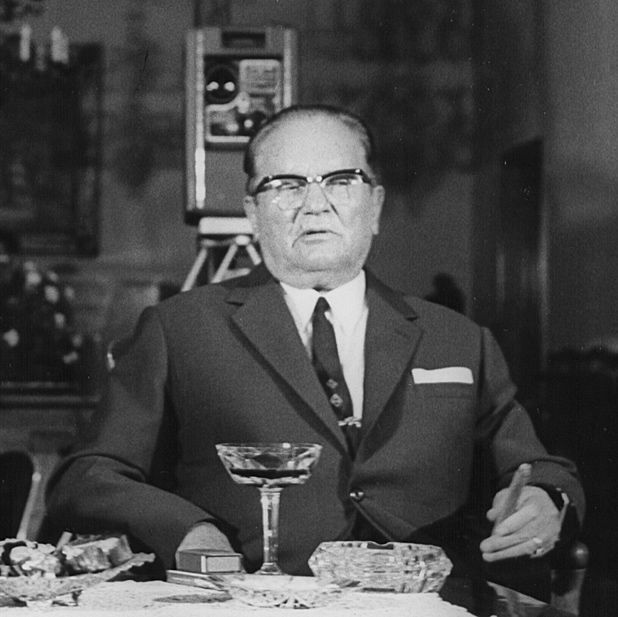 As Yugoslavia came together as a new nation in the aftermath of World War 2, leader and confirmed film buff Josip Broz Tito (pictured) fully embraced the power of film to help forge a new national identity. Initially his model for this endeavour came from his friends in the Soviet Union: glorifcation of the state and its workers, rejection of glamour and frivolity. However once Tito split from Stalin in 1948, he invited Hollywood and its product to Yugoslavia, importing Hollywood movies and developing studio facilities for inexpensive location shooting. Yugoslavian productions, closely monitored by Tito himself, fell into a mode of sentimental triumphalism: tales of wartime derring-do repeatedly showed the Yugoslavian partisans’ Nazi opponents marvelling at and envying the pluck and fortitude of this indefatigable little nation. Mila Turajlic’s documentary uses archive news footage, film clips and interviews with those who were there to chronicle this unique chapter in the fashioning of a culture, dominated as it was by the personality of history’s most celebrated ‘benign dictator’. It’s interesting stuff, but Turajlic’s film is determinedly depoliticised and as such somewhat light and distant. She prefers to treat her interviewees – including Tito’s personal projectionist, who retains a nigh-creepy level of weepy devotion to his late boss – as cute relics of a funny old time; and she doesn’t address whether Tito’s manipulation of artists and the development of film in his country was ultimately a constructive or a negative thing. Further contextualisation regarding the development of cinema culture since the traumatic break-up of Yugoslavia wouldn’t have gone amiss either. As it stands, this slicky-produced documentary comes together as a piece of mild Commie kitsch: plenty of diverting anecdotes and intriguing talking heads, but not much deep penetration into the events and issues depicted or their wider impact. Selected release from Fri 23 Nov. Compiled from forgotten Yugoslav films, archive from film sets and Tito’s private screenings, comes this take on the history of Yugoslavia and its government-funded film industry, which collapsed along with the country.